We are, of course, talking about The Meg. In it, “a deep-sea submersible—part of an international undersea observation program—has been attacked by a massive creature, previously thought to be extinct, and now lies disabled at the bottom of the deepest trench in the Pacific…with its crew trapped inside. So, if you’ve been keeping up with news regarding this picture, then you’ve probably noticed that it’s been making some generous waves in the past few months – and that was before the first trailer even surfaced. And now that it has, we imagine that anticipation for this one will only increase. Naturally, the marketing machine will gain momentum as opening weekend draws near, with a new poster being released in this case. 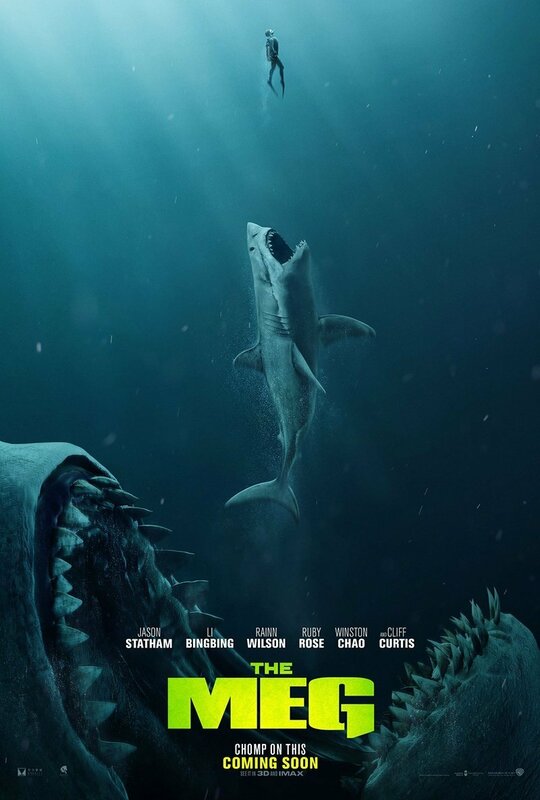 Funny enough, it calls back to the aforementioned Jaws, really putting into perspective how greatly The Meg‘s antagonistic ocean dweller dwarfs his cinematic predecessor. As you can see, only the mouth of the impressive Megalodon is able to fit in the image, making the otherwise intimidating Great White look like a minnow by comparison. And to be honest, this may be my favorite depiction of the food chain since Troy McClure explained the concept on The Simpsons many years ago. The Meg opens in theaters on August 10.